Nikolaou, I. Georgiou, K. Bauer, T.N, Truxillo, D. M. (in press). Technology and Applicant Reactions. In R. N. Landers (Ed.). Cambridge Handbook of Technology and Employee Behavior. Cambridge: Cambridge University Press. Nikolaou, I. & Foti, K. (in press). Personnel Selection and Personality. In V. Zeigler-Hill & T. Shackelford (Eds.) The SAGE Handbook of Personality and Individual Differences. London: Sage. Nikolaou, I. & Tsoni, E. (in press). Internet Recruitment. In B. Warf (Ed. ), The SAGE Encyclopedia of the Internet. London: Sage. Nikolaou, I., Bauer, T.N & Truxillo, D.M. (2015). Applicant Reactions to Selection Methods: An overview of recent research and suggestions for the future. In I. Nikolaou & J. K. Oostrom (Eds.) Employee Recruitment, Selection, and Assessment. Contemporary Issues for Theory and Practice (pp. 80-96). Hove, East Sussex: Routledge. Ryan, A. M., Inceoglu, I., Bartram, D., Golubovich, J., Grand, J., Reeder, M., Derous, E., Nikolaou, I.Yao, X. (2015). Trends in Testing: Highlights of a global survey. In I. Nikolaou & J. K. Oostrom (Eds.) Employee Recruitment, Selection, and Assessment. Contemporary Issues for Theory and Practice (pp. 136-153). Hove, East Sussex: Routledge. Sackett, P.R., Shen, W. et al. (2010). Perspectives from twenty-two countries on the legal environment for selection. In J. L Farr and N. T. Tippins (Eds.) 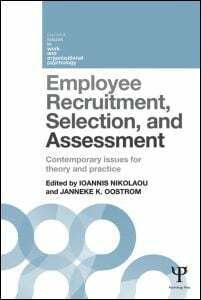 Handbook of Employee Selection (pp. 651-676). New York: Taylor & Francis. Nikolaou, I. (2008). “No strings attached”. Keeping the people balance in organizations. In Neumaier, O., Schweiger, G. & Sedmak, C. (eds. ): Perspectives on Work. Impulses from Salzburg. Munster etc. : LIT Verlag. Nikolaou, I., Vakola, M. & Robertson, I.T. (2006). 360 degree feedback and leadership development. In R. Burke & C. L. Cooper (Eds.) Inspiring Leaders (pp. 305-319). London: Taylor & Francis. Vakola, M., & Nikolaou, I. (2002). Organisational readiness for organisational change: The role of strategy, culture and human resource management. In F. Analoui (Ed.) The Changing Patterns of Human Resource Management (pp. 270-283). Aldershot: Ashgate Publishing. Nikolaou, I., Robertson, I.T (1999). The influence of employees’ work competencies and contextual behaviour on managers’ performance appraisals. In Jansen, P.G.W., Pepermans, R. (Eds. ), Empirical studies of managerial behaviour, development and socialisation (pp. 79-94). Leuven: Acco. Kantas, A., Kalogera, S. & Nikolaou, I. (1997). 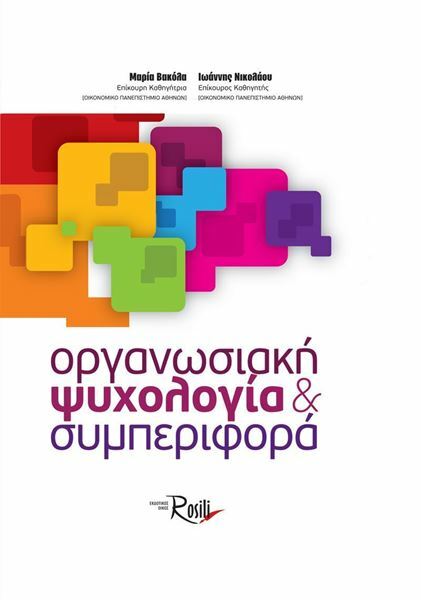 Recruitment and selection: Managerial practices and perceptions in the Greek private sector. In Pepermans, R., Buelens, A., Vinkenburg, G.J. & Jansen, P.G.W. (Eds. ), Managerial Behaviour and Practices. European Research Issues. (pp. 81-90) Leuven: Acco. Nikolaou, I. (1999). The five-factor model of personality and work behaviour in Greece. Unpublished PhD Thesis submitted to the University of Manchester Institute of Science and Technology Manchester.